As you all know I am reading nearly all of my books in English (I can't even remember what the last German book was, I read haha). But I often get the question of the why and how, so, that's what I want to answer today. I think the most important part of the question is why you should even bother picking up books in their original language and the answer is obvious: they are just so much better! I mean of course the story will be the same no matter the language, but if you read a book in the language it was written in you will get to know the story to its full extend - every word is spoken like the author intended it to be! With translations there is always some part lost - even if it is just the tiniest part of drama or passion, it is missing! And if you are anything like me, you do not want that! 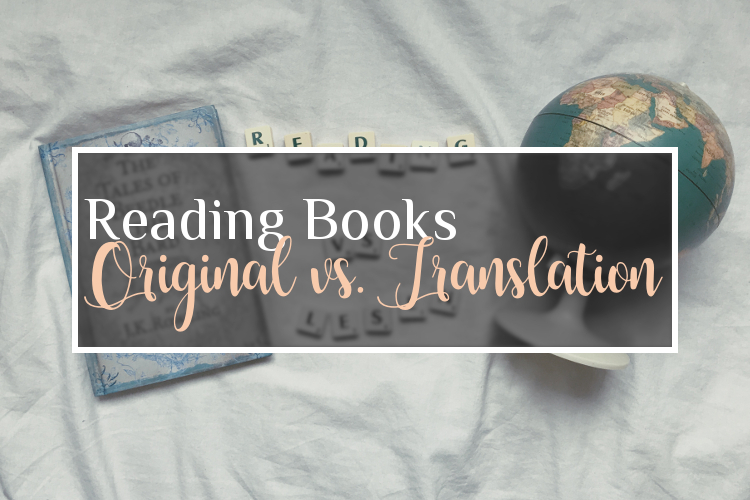 So, as soon as I noticed the difference I always tried to pick up books in the language that they are written in - fortunately for me I am quite fluent in Englisch (obviously - hence the blog) and it was easy for me to get used to reading the language. Nowadays I don't even notice the difference between English and German anymore, I will just remember the story, not the language I read it in - but at first, it will be a struggle and I feel you, if you say, that it is a lot less relaxed, but I also promise: it is worth it! Take your time and struggle through the first five to ten books and after that it will just get easier. But what about the Languages I Don't Understand? So, I am also trying to read Spanish books from time to time, but with them I am at the stage of struggling very (very!) much and of course there so many more books in languages I can't even begin to understand. Those are the books I will pick up in German - just to activate my German skills for once (like, I forgot so much of my mother tongue - I especially struggle with creative writing). And I know, you can't possibly learn all languages - but damn me, if I don't try haha.